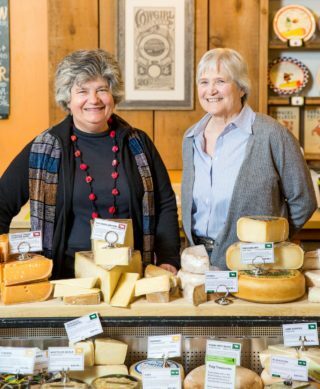 In 1997, Sue Conley and Peggy Smith opened Cowgirl Creamery in Point Reyes Station, a picturesque postage-stamp-of-a-town on the coast about an hour north of San Francisco. They started with an old barn, made it beautiful, put in a small plant for making crafted cheese, and bought organic milk from their neighbors, Straus Family Creamery. From the beginning, they wanted to make delicious, artisan cheese, to be environmentally responsible, and to support their cheesemaking friends in sustainable land stewardship. Today, Cowgirl Creamery continues to make just a small collection of cheeses — five aged and three fresh.